I like to think of myself as a hermit even if it is really a fantasy. The same way I like to say that I am a country girl because of the summers I spent as a child in Mashta el-Helou in Syria and Reshmaya in Lebanon. In reality I am neither, and my life is mostly very urban and thankfully full of excitement, with the most recent being a day trip to Copenhagen to eat at Noma, invited by my lovely friend Seen, who you can see in the picture above talking to Rene Redzepi and Lars Williams who brought us most of our dishes, explaining everything in detail in his soft voice. 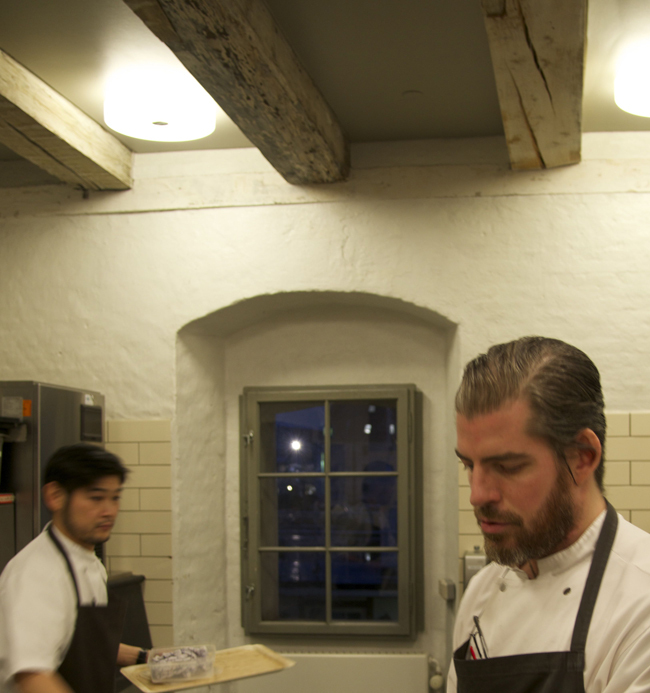 He was utterly charming, as was everyone at Noma. 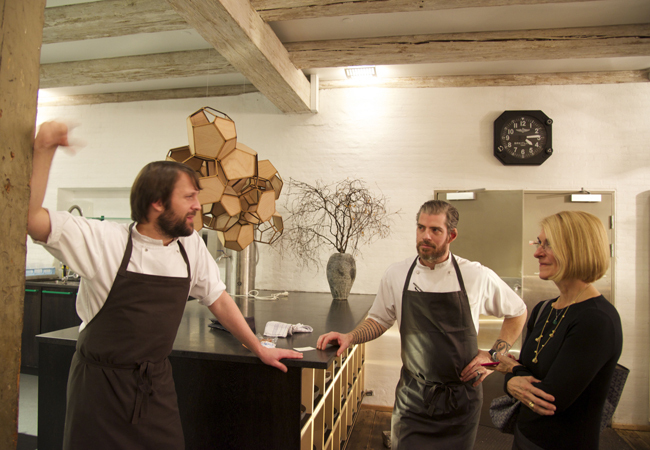 It is part of Redzepi’s brilliant philosophy which makes his restaurant such a perfect place, both for the amazing food and the setting from the welcome and the attentive and friendly service to the aesthetics of the whole place, inside and out as well as front of house and back in the kitchens. I had already been there, also with Seen and her husband Fred and other friends, in summer two years ago and I was intrigued to see what the menu was like in winter. 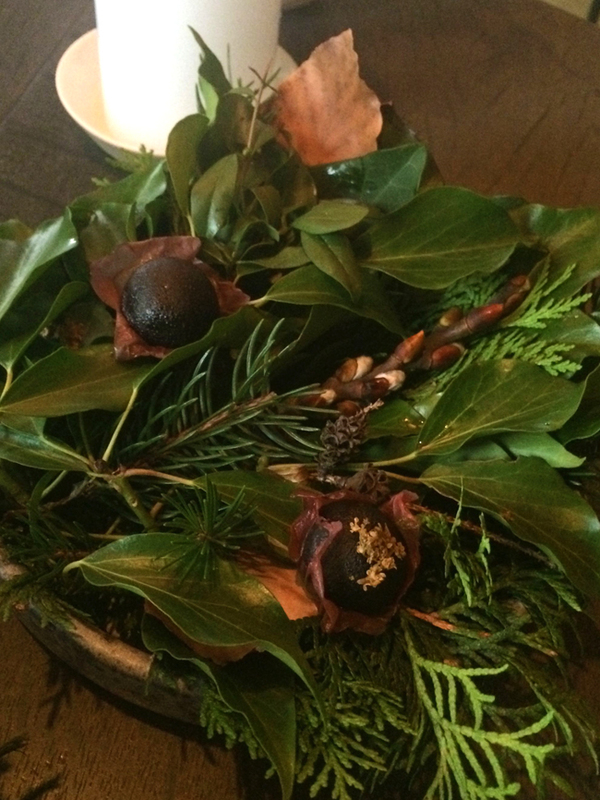 Naturally, it was very different except for one dish, the classic moss which this time was flavoured with cepes. 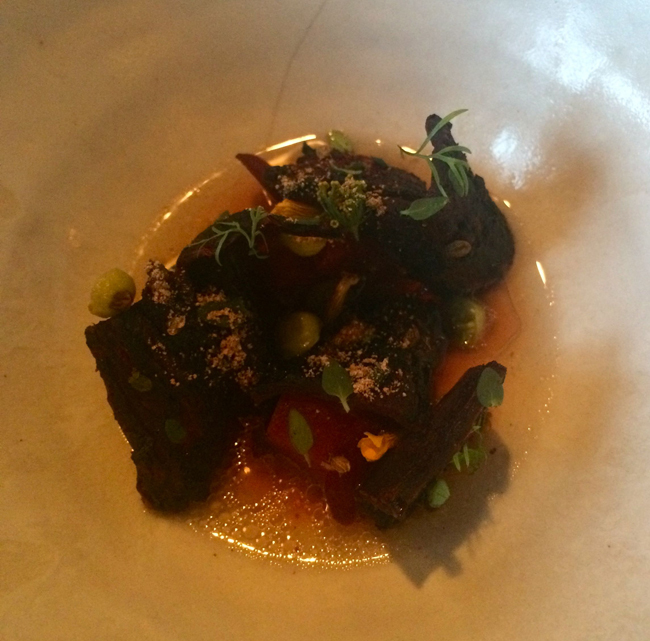 Here are the photos of what we ate. 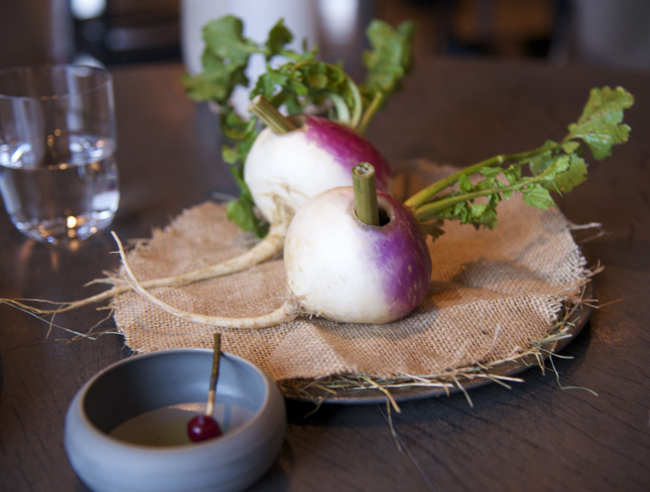 Described on the menu as Nordic coconut, a rich broth poured inside kohlrabi and sipped through a bamboo (I think) straw. 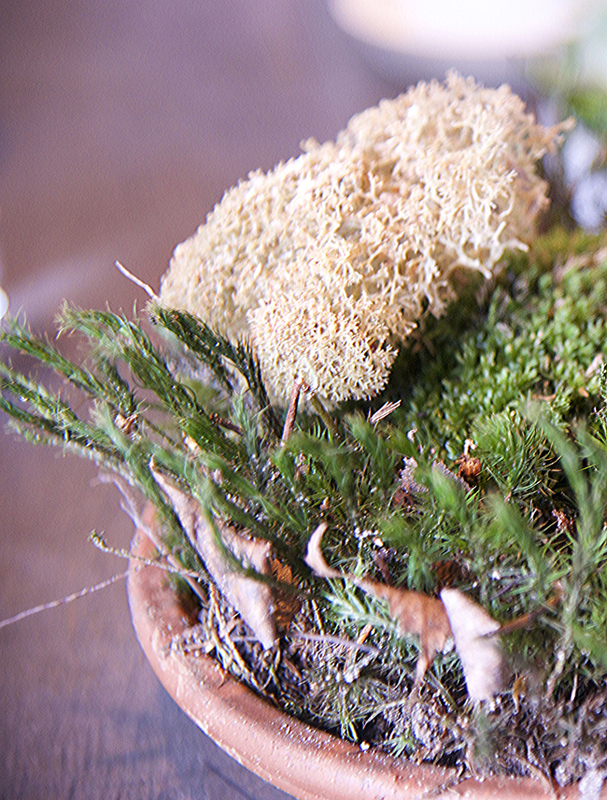 The famous moss with flecks of cepes inside it. We forgot to dip it in the sauce that came with it but it was delicious all the same. This was quite an extraordinary creation, simply described as blackcurrant berry and roses, with an incredibly thin and crisp outer shell (not sure how they achieved this) covering a custard and placed inside a filo-like pastry that was totally soft and pliable. Amazing! 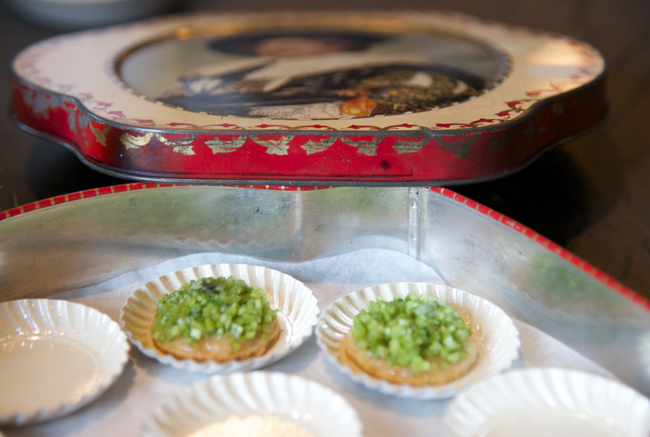 We loved these cheese cookies garnished with the stems of whatever herbs they use in the kitchen chopped very fine. 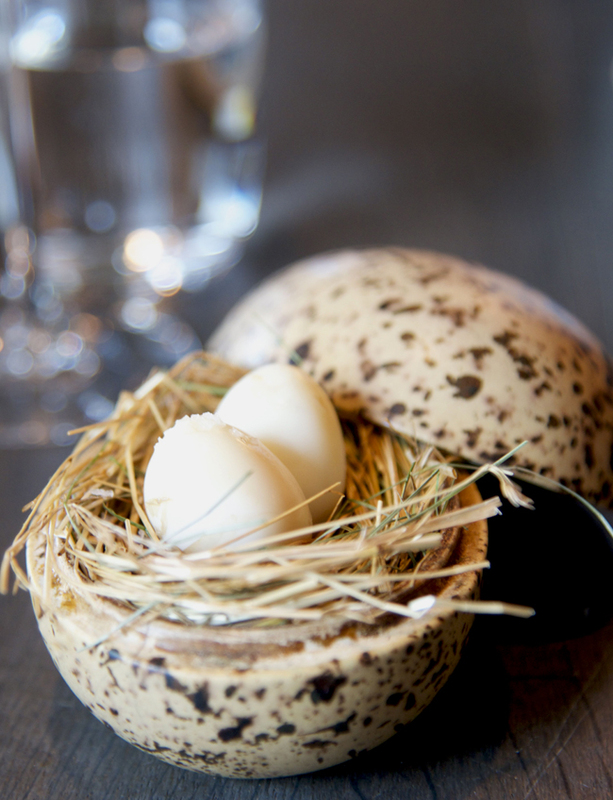 These pickled and smoked quails eggs were just perfect, very soft with a subtle smoky flavour. 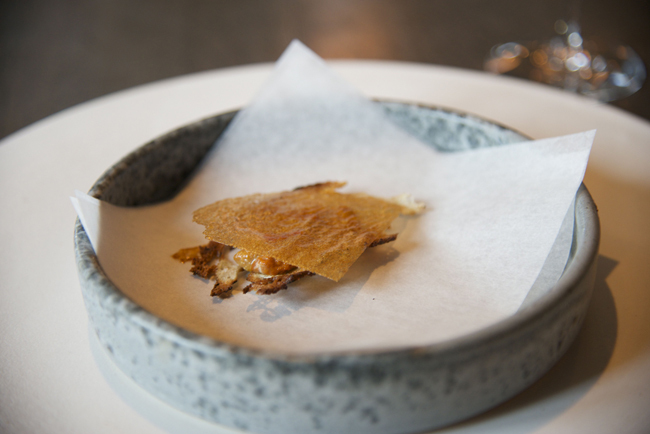 We had had something similar the time before but this time, the curled slivers were monk’s liver and the crisps caramelised milk! I love chestnuts and I sometimes eat them raw, spending quite some time peeling the furry inner skin and I could eat them prepared like this every day, sliced thinly and served with trout roe. 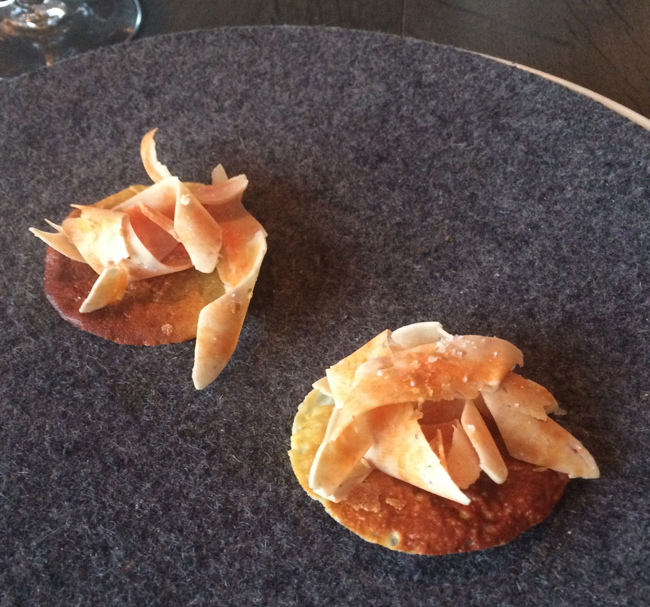 A change from the chicken skin, duck skin covering sea urchin on toast. Exquisite. 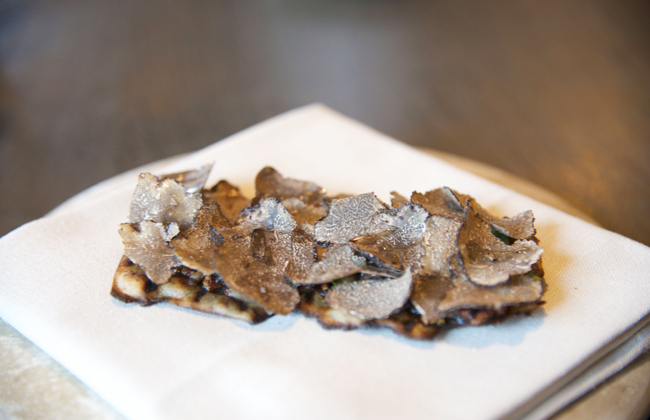 These local truffles were flavourful and the flat bread on which they were laid quite delicious. 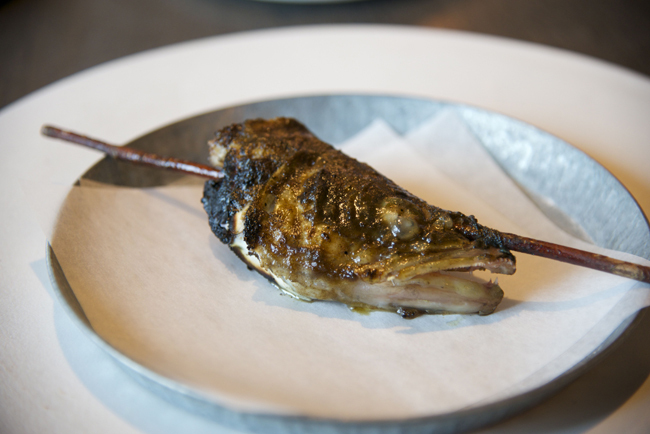 This was probably my favourite dish of the whole lunch, a roasted pike’s head with the most luscious cheeks. I forgot to eat the tiny brain! But as you can see I did a pretty good job cleaning it of everything else! 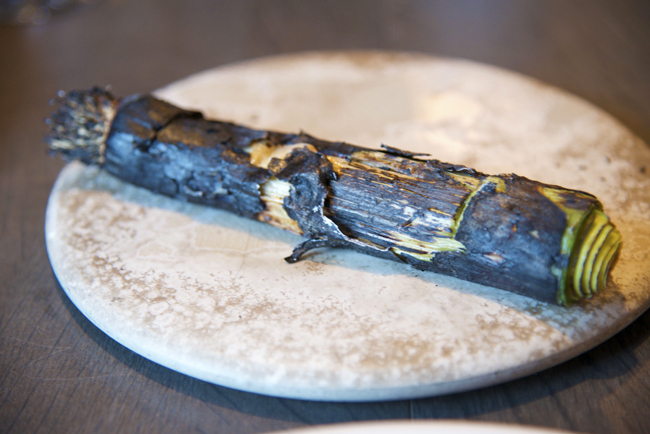 I love leeks and this one was particularly delectable. Burned on the outside and slit for us to open and find a perfectly tender inside, dressed with a delicious ??. Sorry I forgot what the sauce was. 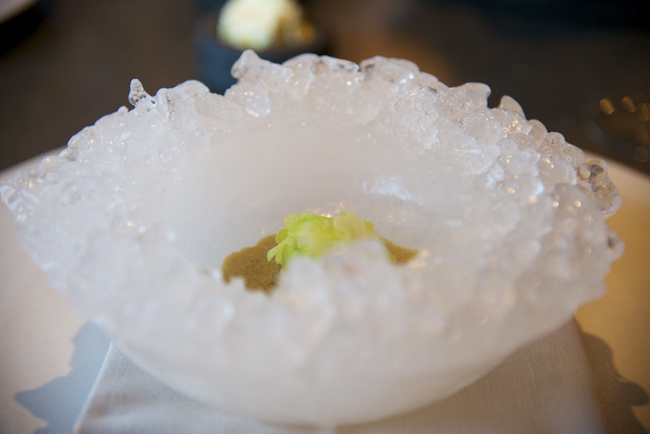 This reminded me of the sashimi I once had at Urasawa which came on a beautiful block of ice. 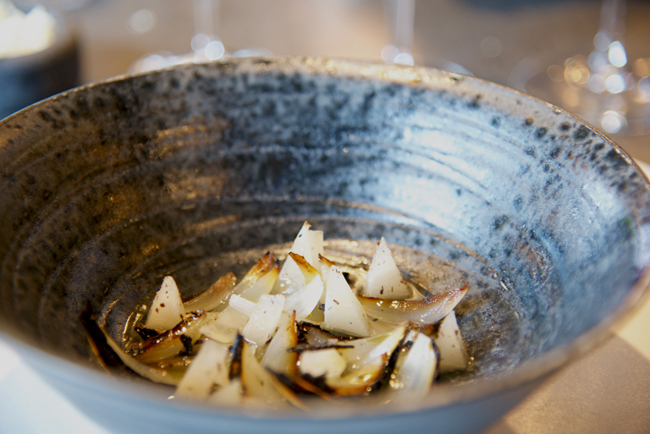 His had jagged edges whereas this one which had squid and fennel inside it was quite beautiful and organic even if I am still wondering at how they got all those knobbly bits to align so perfectly! 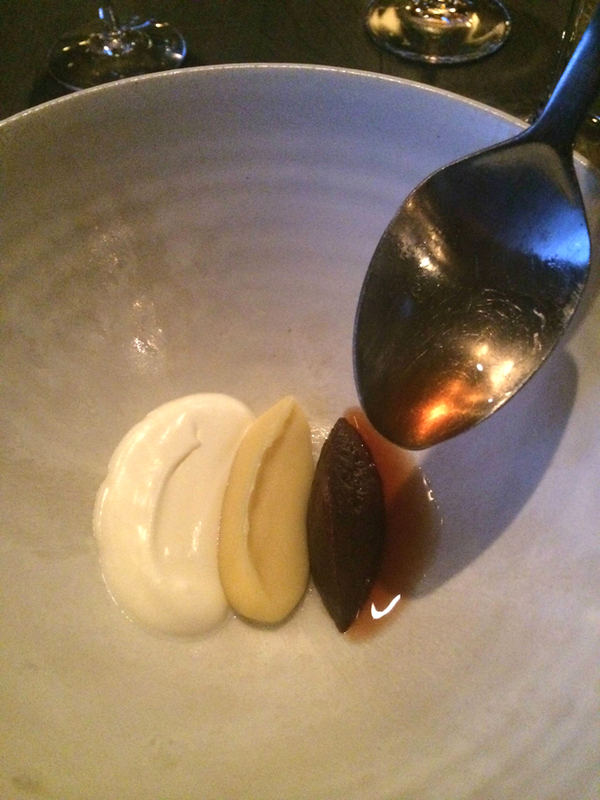 This fresh milk curd with blueberry preserves was a brilliant counterpoint to the squid and a marvellous transition to the onions and pears below, which were dusted with roasted ants powder or perhaps the ants were dried. I still have to see the attraction of ants and will never forget the vile one I had in Sao Paolo a few years back. I can still taste and feel the horrible liquid that oozed out as soon as I bit into it! 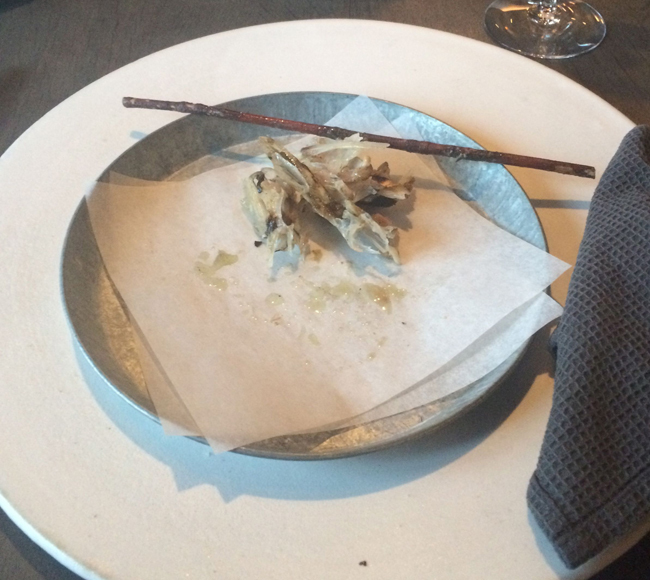 This single mahogany clam that was cut into strips and served with a sauce (again ?? ?, sorry) was quite luscious and so prettily presented. They have an interesting way of roasting beets, until they are almost calcified. They then discard the very hard outer layer, before shaving off the slightly less hard inner layer and finally getting to the tender heart which they dice. 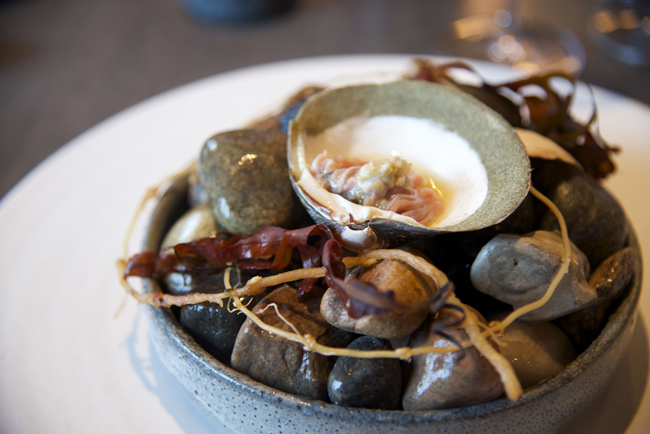 An intriguing play on textures and flavours given that the outer layer has a more concentrated taste. 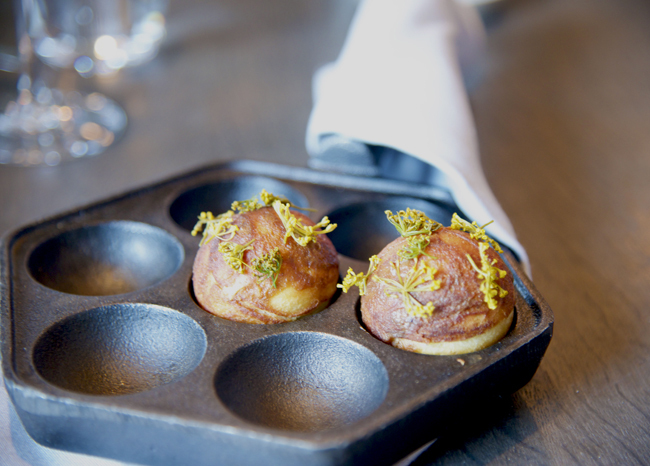 The aromatic herbs were a lovely complement. 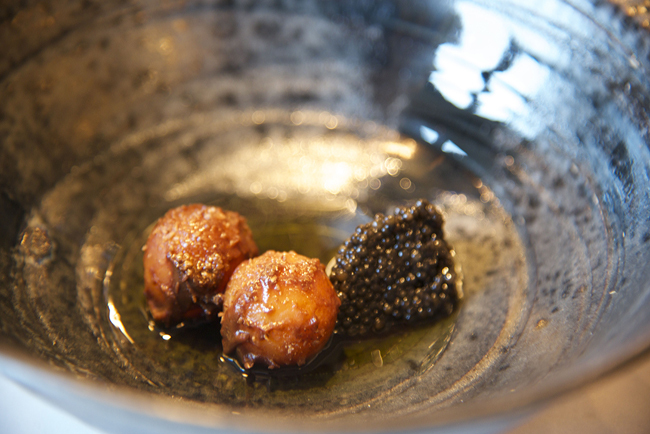 And here, I loved the firm, waxy potatoes served with the local caviar called lojrom. 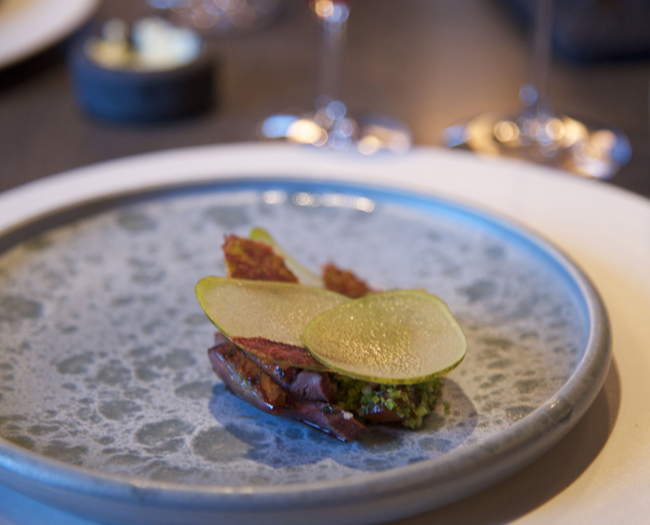 The last savoury course was fabulous slices of wild duck with pear and kale. Incredibly refined. 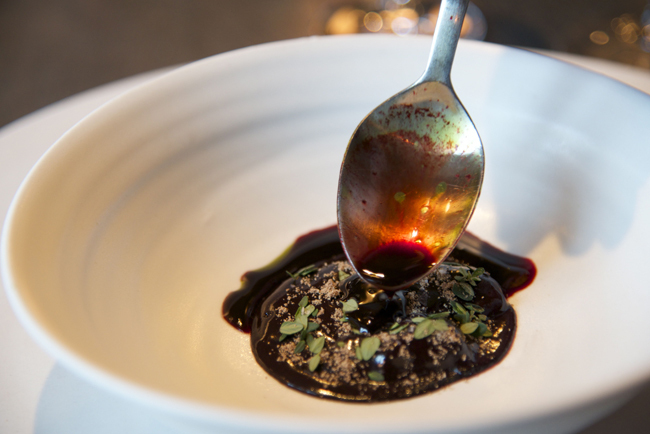 I already knew that Redzepi doesn’t really do sweet desserts but it took both Seen and I a couple of bites before we actually started to like this one described simply as aronia berries and sol. 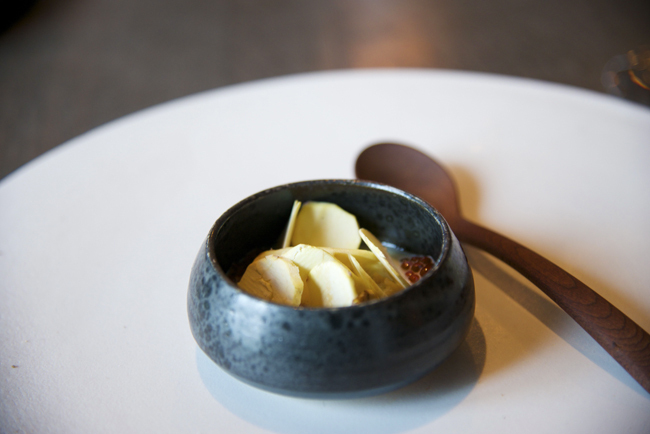 The shell was frozen with a creamy custard spooned into it and a syrup drizzled over the custard before the whole thing was inverted and served with a sauce. I am sorry again but I don’t remember any of the descriptions except that we both loved it by the time we had the last bite. And here is another unusual but delicious dessert made with potatoes and plums! 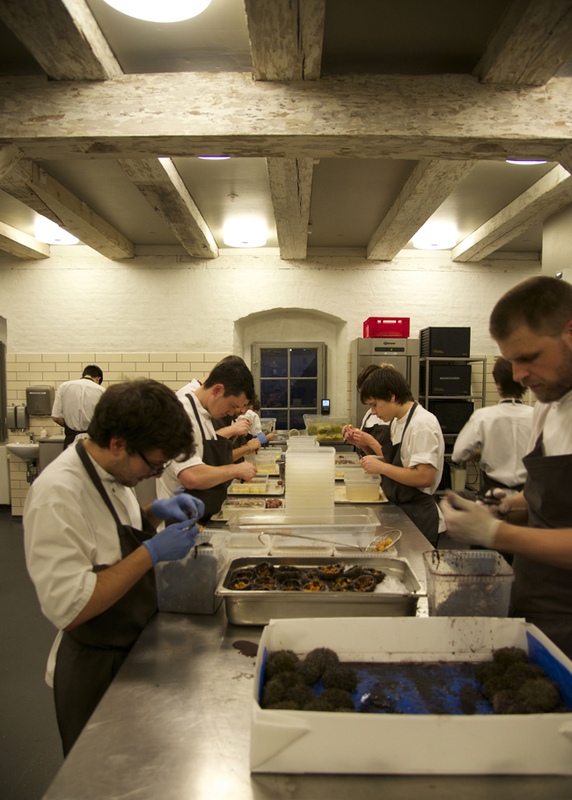 When we finished, Lars took us on a tour of the kitchen and at this station, most of the chefs were peeling the tiny potatoes we had eaten with the trout roe while the two chefs in the forground were taking the sea urchins out of their shells then rinsing them. It was the first time I had seen sea urchins being rinsed. I wonder if the Italians do it. I need to ask. 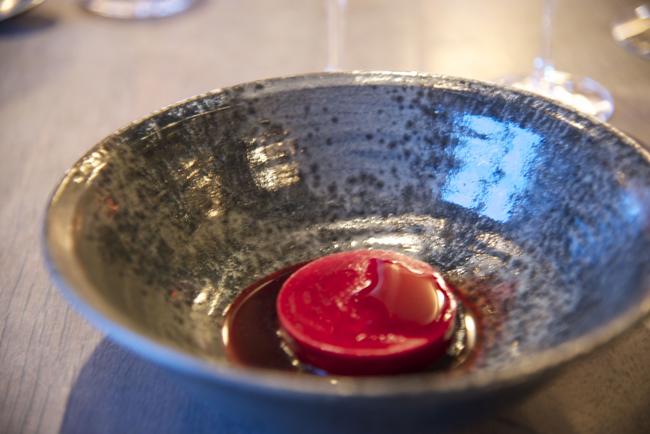 And here is a close up picture of lovely Lars as he was showing us the roasted beets. All in all a brilliant lunch that was just as spectacular as the first one. Thank you again Seen! Do you know where I can buy brains in London please; was given your offal book for Christmas and I wouldn’t know where to go! Thanks. I cooked your calf’s foot on Saturday; it was really delicious, but I just wondered where I’d gone wrong with the cooking time. You suggest 2.5 hours; it took me closer to 6 before it was delciously unctuously tender! how extraordinary jem. perhaps it was the age of the animal :)? Thanks. I think it may well have been an Ox foot!